Guided deer hunting greatly increases the likelihood of grassing a great trophy. Don Caswell says hunting guides have the skills, experience and access to good country needed for success, but it is not always easy. “It never rains in July,” I said loudly over the noise, but the joke had worn thin and nobody responded. The four of us stood, cold and sodden, looking out at the torrential rain. The noise on the overhead galvanised iron roof was near deafening. The promise of a hot lunch had lured us back to base in an effort to try and warm ourselves. We had been out on the quads since before dawn. Cold drizzle interspaced with heavy downpours had been the order of the morning, just like the previous days. We had father and son Kiwi hunters, Tony and Nathan, seeking a trophy Chital stag each. Tony had conceded first shot to his son Nathan and the young fellow had dropped a good stag on the second morning, after a great stalk in drizzling rain. The weather had gotten progressively worse since then, and despite many promising stalks, we had not yet been able to find a trophy class animal for Tony. He was an experienced and disciplined deer stalker and had passed up a couple of stags that a less discerning hunter may well have pulled the trigger on. The country was saturated and all the creeks were running bankers, greatly limiting our avenues of opportunity. After hot showers and a change into our least wet clothes we sat down to a big, hearty hot meal, cooked up by guide Tello. Everyone’s’ humour improved with that and a few big cups of steaming hot tea to wash it down. Our Kiwi clients pondered aloud whether they were really in Queensland at all. The weather was much more reminiscent of Fiord Land back in New Zealand and, as we all knew, it was not supposed to rain in Queensland in July. We dwelled awhile over lunch; nobody seemed enthusiastic to go back out in the cold rain. Tello broke the spell though, and with his typical dedication, had us back out in the rain in short order. It was a couple of hours into the night when we finally got back, unsuccessful once again. The rain had been unrelenting and we had pushed as far out as we could. The trip home had been a long and difficult one with rising creeks and many kilometres of greasy, black soil tracks to fight the quads through. Shivering, saturated through from head to foot, and liberally plastered with black mud, we must have looked a site as we dragged ourselves back into the quarters. Once again, hot showers and a big, hot meal restored our spirits. The next day was our Kiwis’ last day and we had yet to get Tony onto an acceptable trophy. On top of that was the looming problem of getting our clients out and back to Townsville airport for their flight home. All access roads were cut by creeks running metres above their normal levels. Overnight the heavy rain eased off. When Tello roused us all from our beds for another pre-dawn start we were pleased to find light, misty rain rather than an ongoing torrential downpour. After a quick breakfast we reluctantly dragged on our wet, cold hunting gear. None of us even had dry socks and all clothing and boots were sodden and heavy. We rode the quads only a kilometre or so from the homestead, then set off on foot in the early morning mist at first light. Nathan had elected to go along as observer and photographer of his Dad’s hunt rather than take the opportunity to do some cull hunting with me, so the four of us set off, keen to get Tony his trophy on this, the last day of the hunt. The normally dry gullies were still running with water, but now it was just a trickle, compared to the torrents of the last few days. Large deposits of sand and silt attested to how high the waters had risen. These newly formed sand banks also told a story of the game that had recently crossed them. There was plenty of fresh deer sign where stags and their harems had crossed the creek not long before. Typically, we made short, slow advances and then spent extended periods glassing the surrounding bush, looking for deer. Tello has this technique mastered and the challenge, with some clients, is to restrict their eagerness to move forward too quickly, especially when a potential trophy stag has been spotted. Apart from the challenge of finding a trophy animal, the other major aspect of a successful trophy hunt is knowing where all the other deer in the vicinity are. An eager and incautious approach on the trophy animal will often be spoilt by the alarm call of the old hind you failed to notice off to one side. So it is that a successful trophy stag hunt is generally based on a lot of glassing with binoculars. After stalking slowly for an hour or so, there was a lengthier pause than normal as Tello seemed frozen with binoculars to his eyes for an inordinately long time, even for Tello! At his beckoning, Nathan and I very slowly and cautiously drifted up to join him and Tony. In the barest of whispers Tello told us he had spotted a likely looking trophy stag, bedded down behind a bush. It took quite a bit of direction before we could finally see the stag ourselves, heavily screened by an intervening bush. Only a highly experienced and disciplined guide, like Tello, would have spotted that animal under the circumstances. We discussed a game plan in hushed whispers. However, before we could start on the plan to flank the stag for a shot, more deer came drifting over the nearby ridge and blocked the intended path. What with the wind and scattering of nearby deer we had no option but freeze and remain motionless until the situation improved. Well, the minutes dragged by, leading into hours. Tello and Tony had decided that this was the stag and they were prepared to wait him out rather than go off in the hope of finding something else. If you have never tried to remain perfectly still for any period of time then you will have no concept of how difficult that can be. Muscles and joints ache and burn. Maddening itches and crawling insects have to be tolerated. Tickling throats cannot be relieved with a cough. If a movement is unavoidable it must be done with great slowness and care. One consolation was that the mist slowly cleared as the morning developed and the light rain ceased as well. The sky, still overcast, nevertheless began to lighten and there was a hint that the sun was trying to re-exert itself over the land once more. Finally, as midday approached, the deer all decided to move on. They were not alarmed, but as if to some silent signal, the various deer scattered through the bush all about us began to walk slowly off in the same direction. The trophy stag remained put for some time though and it was not until most of the other deer had moved off that he rose from his bed. Tony was ready for the shot and the 270 Winchester boomed in the gully. As we walked up to the fallen stag the sun finally broke through the clouds and washed the land in pale, cloud-filtered light. We were all happy, but Tony was quite rightly elated. 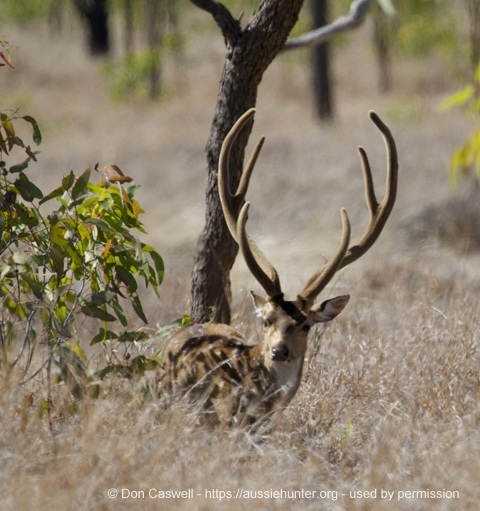 He had grassed a fine trophy Chital after days of hard and challenging hunting and the final stalk had been demanding of patience and perseverance as well. Early the next morning I farewelled Tony and Nathan as Tello drove off on the journey to the airport. While he was dropping them off and collecting the next client I busied myself in restoring order to the camp and trying to dry out clothes and kit. There was no more rain and enough intermittent sunshine to achieve that reasonably well. Tello made good time, despite the slippery dirt roads and still high creek crossings, and I was a little surprised when his vehicle pulled in around about 4PM with Clint, an Aussie deer hunter keen to get his first Chital. After getting his gear unpacked, Tello took Clint to the range to test the sighting of his 300 Winchester Magnum. I had nothing better to do, so I tagged along as well. Clint fired three shots, all nicely on target to everyone’s satisfaction. It was quite a nice afternoon and, as there was still an hour or so of daylight, we figured we would do a little glassing off the road, hoping to show Clint a few Chital before we began hunting in earnest the next day. As we stood on the edge of the road, binoculars in hand, the property owners came by on their quads, returning from a day of repairing flood damaged fences. They stopped to meet Clint and have a chat for a while. Before they left they mentioned they had earlier seen a mob of pigs moving down the creek in our direction. There was only half an hour of daylight left. Tello figured we could motor down to the nearby creek crossing and expect the pigs to arrive there just about right on dark. Clint may well get a chance to shoot a boar, without interfering with or jeopardising his chances of a trophy stag in the days to come. Once clients have taken their trophy, and have time up their sleeve, it is common practice to do some cull hunting of deer and shoot a few pigs as well. It was however unusual to start a trophy hunt by shooting secondary species first up. We rode the quads a kilometre or two then parked, to walk the last half a kilometre down to the creek. We had only walked a few hundred metres when Tello signalled us to stop. Directly ahead of us, about 150 metres away, two big stags were brilliantly highlighted by the last rays of the setting sun. They were in the open, short-grassed country of the creek flood plain. The two stags were feeding off the fruit of a lone shiny-apple tree. In that setting, in the fading pale gold light of the day, they were a sight to behold. Both seemed to have exceptional antlers too and displayed them nicely as they thrashed the overhead tree branches to shake down more fruit. “They both look like keepers to me, but you are the expert here.” I replied. I stayed put behind a tree and watched the stalk. Tello and Clint moved forward carefully to close the distance to about 120 metres. After a few more minutes of careful scrutiny they decided on which of the two was their preferred target. Clint settled in, using a tree for a lean, and took the shot. By the time we got back with the quads it was quite dark. Our usual hunting kit was back in camp, along with the camera gear, as we had started out with no expectation other than a few shots at the range. Luckily Clint had his mobile phone in his pocket, so we got some photos on that before Tello set about caping out the head in the light of a small pocket torch. Even though Clint shot his trophy virtually the minute he arrived we still had an enjoyable four days of hunting with him. With the pressure off, so to speak, we explored obscure corners of the vast property, chasing pigs and wild dogs. I dropped Tello and Clint off well out on the track and they spent the best part of one day walking back to camp, hunting as they went. Along the way Clint shot a number of cull does and took the skins for tanning. Those two, consecutive hunts neatly demonstrate the full spectrum of what you may expect on a guided trophy deer hunt. Sometimes it can be very demanding and sometimes ridiculously easy. Whether hard, easy or average you can expect your guide to find you some quality animals and help you to secure a memorable trophy. Along the way you will learn a lot about the finesse required to consistently find and stalk trophy deer, and have a thoroughly enjoyable hunt. Since 1981 Don Caswell has been a freelance writer, photographer & illustrator. Don is the author of hunting stories and the provider of technical shooting information. Don an independent reviewer of hunting, shooting & outdoors products, in addition to being a blogger & webmaster with Facebook & Instagram presence. Don is also a senior writer for the Sporting Shooters Association of Australia (SSAA) and his articles appear regularly in their publications. This article was originally published in the SSAA in April 2014.